Facial recognition is nothing new as there have been products in this field for years. The acceptance of facial recognition, on the other hand, has been limited due to the reliability of the technology in real-world situations (such as varying light conditions and the requirement to face the camera straight on), as well as the amount of processing power required to detect and identify a face. These issues hampered the uptake of facial recognition for real-world, near real-time use. In addition to this, the many examples of people being able to fool facial recognition systems – known as spoofing – has also cast some doubt on the technology. ZKTeco recently took a deeper step into the facial recognition market with the launch of its new series of visible light facial recognition (VLFR) products. The company says VLFR overcomes the shortcomings of previous facial recognition products and uses deep learning to improve recognition and reliability, and it is far better at catching fake faces. As mentioned, the VLFR system ZK developed beats fake faces through its anti-spoofing algorithm, which conducts liveness detection by learning how to differentiate lighting, texture and resolution. The system also uses two cameras. One is a visual light camera that is used for recognition and verification, the other is an infrared camera used to detect fake faces. People who try to verify a fake identity by using a picture on paper or on their phone or tablet, for example, will quickly find their access is denied. Even using a high-definition video of a face won’t be accepted. The utility of these systems is in the flexibility of the verification process. Instead of having to stand directly in front of the cameras, people can be recognised ‘on the move’ as they approach the point of entry. The VLFR system will detect their face and track and identify them as they approach. It is also able to recognise an enrolled face with a deflection angle of 30% – left to right, and up and down. It can detect and recognise faces, more than one at a time, and it can also capture faces in a certain area, for example at a sporting event or in retail environments. The 30% deflection means people will be recognised even if they are talking to someone next to them, walking and texting, or simply looking around. Wearing a cap or glasses will also not stop the system from its recognition job, unless the items hide a large proportion of the face. Depending on the product chosen, the recognition process starts at a distance of 3 metres from the cameras (making it really ‘touchless’) and the verification takes 0.5 seconds, meaning access control in large buildings is possible, even outdoors. There are different ways in which an image can be captured for enrolment, one of which is the person can send a selfie of themselves. Its facial recognition algorithm has been trained on databases with templates from more than 20 races in 180 countries. As with fingerprint biometrics, the system does not store an image of the individual’s face, but rather a template calculated from the image. The company says these templates only consume about 1 KB of storage each, meaning the onsite database is not huge and cumbersome, which means recognition is fast. The system is also supplied with an API to allow it to be integrated with other security and business systems. This is in addition to ZK’s own management software, ZKBioSecurity, as well as the company’s ZKBioserver for template storage and retention. ZK has integrated VLFR into various products, some new products dedicated to access control, as well as certain surveillance cameras. This means that access control is only one job these systems can perform. Currently the ZKTeco FI700, 710, and 710-L cameras have been equipped with VLFR and can support either 5000 or 20 000 facial templates on board, depending on the camera chosen. These cameras can be set up to monitor people in a variety of environments, single out blacklisted individuals or find missing persons in a mall, for example. In the access control field, ZK has a range of products. Starting small, the SpeedFace H5 and V5 systems are designed for traditional access control and T&A tasks. They offer a 5-inch LCD display, can hold up to 6000 face templates and make use of multiple verification mechanisms – facial, fingerprint and RFID. The FaceDepot series supports indoor or outdoor facial recognition, sporting a 7-inch LCD display and a 10 000 template capacity. The G4 is a multi-biometric attendance and access control terminal which holds up to 10 000 facial templates, 10 000 fingerprint templates and 10 000 Mifare card credentials. It also holds up to 1 000 000 transactions. At the high end, the FaceKiosk series offers users a choice between 21-, 32- and 43-inch touch screens which can be placed in areas with heavy traffic. 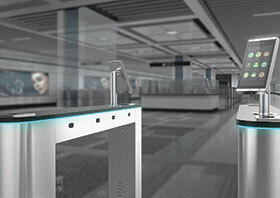 Some of the use cases for the kiosks include access control and attendance management, self-service kiosks, hospitality payment and queuing solutions, automatic ticket vending and so on. These products can detect faces at up to 5 metres and recognise between three and five people simultaneously, while holding 10 000 face templates. While there are many instances where systems like the VLFR products can be used, Hendrik Combrinck, MD of ZKTeco SA offers three examples in which these products can streamline operations. Event and conference registration: Using systems such as a facial recognition kiosk or the G4, conference delegates can be recognised as they arrive and provided with seating arrangements and other information. (They can register with a selfie.) The touch screen can also be used to register new visitors or collect additional information. Know your client: In the banking world, the ‘know your client’ mantra is gaining traction and facial recognition kiosks can be used to greet people as they walk in, provide information and even direct newcomers. Should a VIP guest be recognised, the appropriate people can be notified to make sure they get the service they require. Voter assistance: A kiosk could be used to recognise registered voters at a voting station and direct them. In time, these kiosks could even be used for electronic voting as well.